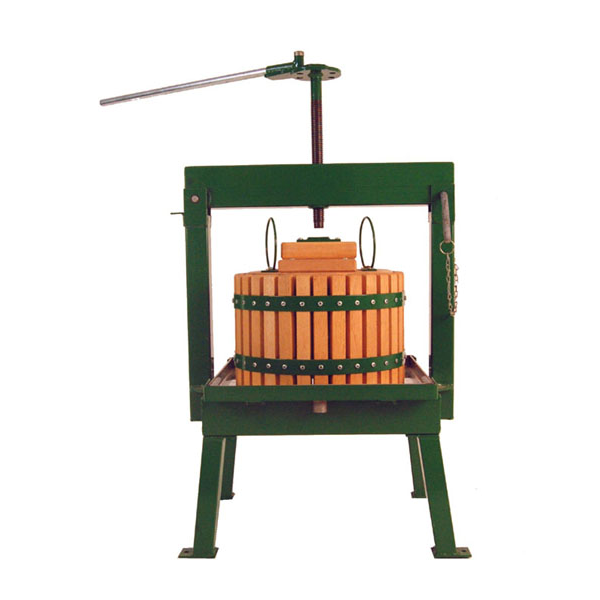 An excellent traditional press for those who have several productive apple trees or grapevines and are interested in producing juice both swifly and in quantity. Swing the hinged cross beam off the press. Line the press cage with a straining bag (available separately) overlapping the side of the press. If using Crusher A or the Economy Crusher (available separately) to mill the apples, locate the crusher on top, mill the apples directly into the press until it is brimful, and remove the crusher. Fold the edges of the press bag to cover the pomace making a parcel. Place the pressure plate and bearing block onto the crushed fruit within the press cage and swing the cross beam back into position lining the screw up with metal bearing. Place the handle in the slot and use a ratchet mechanism to lower the pressure plate. The juice will soon flow down through the press staves into the juice tray, ready for collection. Collect the juice in a food-grade bucket, ready for freezing, pasteurisation or irresistible instant drinking. Easy to clean, simply hose down with fresh water after use and dry with a clean cloth. Lubricate the non-food contact metal parts with food grade grease; this will also inhibit corrosion of these parts. Store in a clean, dry place. Height: 89cm / 35 "
Cage height: 24 cm / 9½"
Cage diameter: 37cm / 14½"
The screw is fitted with a ratchet mechanism for ease of use. The hinged, lockable crossbeam can be swung over to enable Crusher A to fit on top, allowing fruit to be milled directly into the press, saving time and effort. Please note:- From November to April this product is available direct from the manafacturer with a 5-7 day lead time.